Hanover Pond, Meriden, CT: New England Hydropower Energizes First Archimedes Screw Turbine site in U. S.
Restoring North America’s original renewable energy resource. Photo: Power house (left), existing up-stream fish passage (right). The Archimedes Screw Turbine (AST) provides safe down-stream fish passage. NEHC received approval to energize in March 2017. NEHC mobilized for construction at the site in September 2016, and the sluiceway, powerhouse and screw trough were all completed to accept the machinery in December 2016. 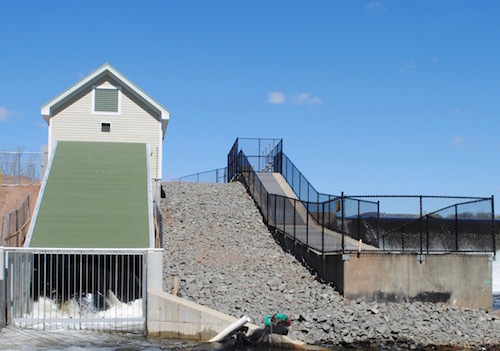 The Hanover Pond Hydro facility entered operation in April 2017.